Potamopyrgus antipodarum is an aquatic snail native to New Zealand that has invaded Australia, Europe, and North America. It can inhabit a wide range of ecosystems, including rivers, reservoirs, lakes, and estuaries. P. antipodarum may established extremely dense populations that can comprise over 95% of the invertebrate biomass in a river, alter primary production, and compete with or displace native mollscs and macroinvertebrates. They can spread rapidly in introduced areas and are able to withstand desiccation, a variety of temperature regimes, and are small enough that many types of water users could be the source of introduction to new areas. 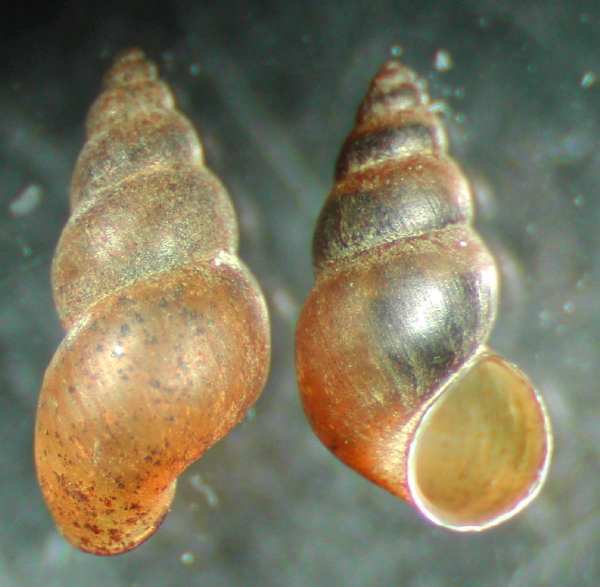 Potamopyrgus antipodarum, the New Zealand mudsnail, is a very small, aquatic snail whose elongate shell consists of 5 to 6 dextral, or right handed, whorls. It is often described as horn colored or light to dark brown. It has an operculum that covers its shell aperture. The average length of P. antipodarum is usually 4-6 mm in introduced locations but may reach 12 mm in its native range. Some populations bear a weak keel located mid whorl (Crosier et al, undated; Levri et al, 2007; NZMS Working Group, 2006; Ponder, 1988; Richards et al, 2002; Zaranko et al, 1997). Potamopyrgus antipodarum was reported in some locations of Europe as Potamopyrgus jenkinsi by Smith (1989) (Gaino et al, 2008). Non-native populations of P. antipodarum are parthenogenetic and consist almost exclusively of female, clonal individuals. In the United States most western populations are a single clone, with a second in a short section of the Snake River, Idaho, and a third in eastern United States (NZMS Working group, 2006). Potamopyrgus antipodarum may live more than a year and has been observed to grow at a rate of up to 0.1 mm/day at 21°C in laboratory conditions (Richards et al, 2002). It may reach sexual maturity in at 3.0-3.5 mm or in about six to nine months (Crosier et al, undated; Richards et al, 2002; Dybdahl & Kane, 2005; Moller et al, 1994 in Alonso & Castro-Diaz, 2008). Potamopyrgus antipodarum is an extremely tolerant species that is capable of inhabiting many aquatic conditions. It colonizes a wide range of habitats including rivers, lakes, streams, estuaries, reservoirs, lagoons, canals, ditches, and even water tanks (Brown et al, 2008; Crosier et al, undated). Reported depths range from 4-25, even 45 meters, but it most often occurs in the littoral zone and moderate depths of around 10 m (Cejka et al, 2008; Zaranko et al, 1997; Grigoorvich et al, 2003). P. antipodarum tolerates a wide range of temperatures, salinities, trophic conditions, water conditions, and current speeds (Gaino et al, 2008; Levri et al, 2007; Crosier et al, undated). It may occupy silt, sand, mud, concrete, vegetation, cobble, and gravel (Crosier et al, undated; Richards et al, 2002). Its densities are reported highest in systems with high primary productivity, constant temperatures, cobble substrate, and constant flow (Richards et al, 2002; Holomuzki & Biggs, 2007), and it thrives in disturbed watersheds (Cejka et al, 2008). Its upper thermal limits are around 28°C and lower limits are around freezing (Crosier et al, undated). It may reproduce at salinities of 0-15 ppt and tolerate 30-35 ppt for short periods of time (Cejka et al, 2008). It can withstand moderate desiccation and drought for several days (National Park Service, undated; Gaino et al, 2008). Within its native range Potamopyrgus antipodarum reproduces sexually and asexually while non-native populations are parthenogenetic and consist almost exclusively of triploid females (Alonso & Castro-Diaz, 2008; Lively, undated). Reproduction is ovoviviparous and offspring are brooded by females in a brood pouch until they reach a mobile stage (Alonso & Castro-Diaz, 2008). Broods are reported to range from 20-120 embryos per female and they produce an average of 230 juveniles per year (Richards et al, 2002; Alonso & Castro-Diaz, 2008). P. antipodarum may reproduce year-round in favorable conditions, but the majority of its reproduction occurs in the spring and summer (Crosier et al, undated; Richards et al, 2002). Potamopyrgus antipodarum grazes on periphyton, diatoms, and plant and animal detritus (Richards et al, 2002; Alonso & Castro-Diaz, 2008; Brown et al, 2008; Levri et al, 2008). The most frequently cited method of long distance dispersal of Potamopyrgus antipodarum is through ship ballast water (Alonso & Castro-Diaz, 2008). Crosier, Danielle M.; Daniel P. Molloy; David C. Richards, undated. New Zealand Mudsnail - Potamopyrgus antipodarum. Recommended citation: Global Invasive Species Database (2019) Species profile: Potamopyrgus antipodarum. Downloaded from http://www.iucngisd.org/gisd/species.php?sc=449 on 19-04-2019. Potamopyrgus antipodarum may establish very dense populations, consume large amounts of primary production, alter ecosystem dynamics, compete with and displace native invertebrates, and negatively influence higher trophic levels. Its ecological plasticity, high competitive ability, high reproductive rate, high capacity for various dispersal methods, and ability to avoid predation make it a formidable colonizer capable of establishing abundant populations with significant effects on ecosystems (Alonso & Castro-Diaz, 2008). 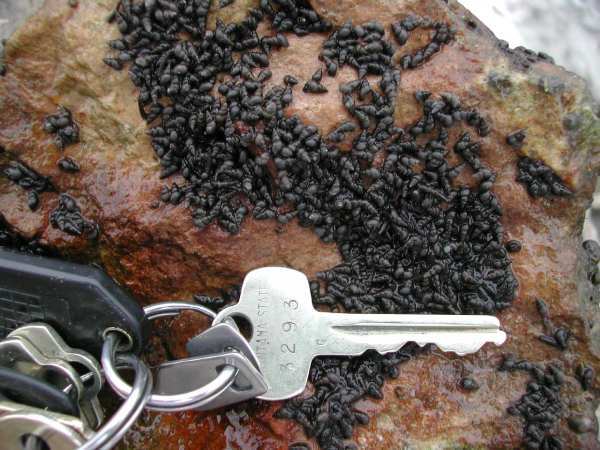 P. antipodarum and its impacts are similar to that of the extremely problematic invasive Zebra Mussel (Dreissena polymorpha) (National Park Service, undated). P. antipodarum can establish extremely dense populations of tens to hundreds of thousands of individuals per square meter in introduced environments. In Australia densities of 50,000 snails/m2 have been recorded (Ponder 1988; Schrieber et al, 1998). In the United States densities of 200,000, 500,000 and even 800,000 snails/m2 have been recorded in several locations (Davidson et al, 2008; Dorgelo, 1987 in Brown et al, 2008; Crosier et al, undated; Hall et al, 20003; Levri et al, 2007). These large populations undoubtedly have significant effects on ecosystems. P. antipodarum can consume up to 75% of gross primary production, dominate secondary production by composing up to 97% of invertebrate biomass, and excreting 65% of total NH4 thereby dominating C and N cycles as in the case of Polecat Creek, Wyoming. Its secondary productivity is one of the highest ever reported (194 g AFDM m-2 yr-1), being 7–40 times higher than that of any macroinvertebrate in Greater Yellowstone area (Hall et al, 2003; Hall et al, 2006; Richards et al, 2002). Such alteration of ecosystems likely results in far reaching cascading ecological impacts (Crosier et al, undated; Davidson et al, 2008; Alonso & Castro-Diaz, 2008). It has also been indicated that it may increase CO2 levels by precipitating calcium bicarbonate to calcium carbonate to produce shells (Chavaud et al, 2003 in NZMS Working Group, 2006). P. antipodarum may displace, inhibit growth in, and compete with native invertebrates for resources in introduced locations (Alonso & Castro-Diaz, 2008; Cowie et al, 2009; Davidson et al, 2008; Hall et al, 2006; Kerans et al, 2005). High densities of P. antipodarum were believed to have negative interactions with native macroinvertebrates in several locations in Montana (Kerans et al, 2005). In the Snake River, Idaho, its site of initial introduction in the United States, it is believed to be a major cause of five species of native mollusks recently becoming endangered (Crosier et al, undated). This includes the endangered hydrobiid snail Taylorconcha serpenticola (Richards et al, 2004 in Brown et al, 2008). 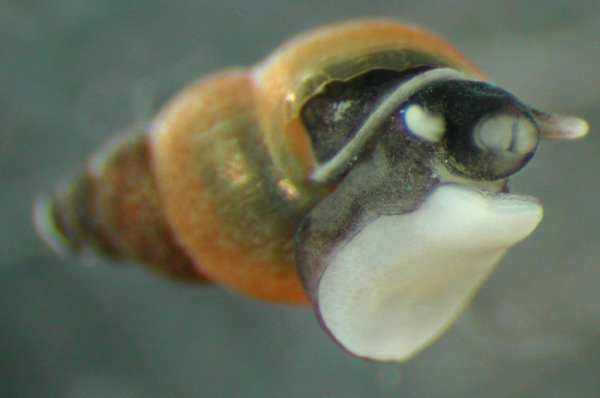 It is believed to limit absolute growth and the growth rate of the native desert valvata snail (Valvata utahensis) in the Snake River as well (Lysne & Koetsier, 2008). It dominates the Mont Saint-Michael Bay in western France and represented 80% of gastropods collected from all sites (Gerard et al, 2003). Similarly, P. antipodarum made up 83% of the mollusk community in a reservoir near an industrial area in Poland (Lewen & Smolski, 2006). P. antipodarum has been found to significantly inhibit growth in endemic snail Pyrulopsis robusta in Polecat Creek, Wymoing (Riley et al, 2008). A negative correlation has been demonstrated with P. antipodarum and important invertebrate species mayflies, stoneflies, caddisflies, and chironomids (Crosier et al, undated). It has also been to have a negative correlation with native hydrobiid snails in Tasmania (Poner, 1988). P. antipodarum directly affects fish by being a poor and mostly un-digestible food source. Although rainbow trout Onchorynchus mykiss and brown trout Salmo trutta were found to feed on P. antipodarum in a study, about 80% of those consumed passed through their system undigested (NZMS Working Group, 2006). Not only does P. antipodarum replace energetic food sources, but it is believed to inflict poor health and reduce survivorship in fish that consume it based the significantly worse condition of fish with P. antipodarum in their guts (Vinsen & Baker, 2008). These direct as well as indirect impacts on fish by P. antiopdarum threaten fisheries in locations where it has established. Additionally, P. antiopdarum has fouling potential as it is known to pass through water pipes, emerge from domestic traps, and may block water pipes, meters, or irrigation systems (Ponder, 1988; Cotton, 1942 in Zaranko, 1997; NZMS Working Group, 2006). P. antipodarum has also been found to be infected by blood fluke Sanguinicola sp. in Europe and represents a possible vector to new locations (Gerard & LeLannic, 2003). Preventative measures: Once Potamopyrgus antipodarum establishes eradication is improbable in most locations and often impractical in those where possible. Prevention of its introduction and containing existing populations is important for minimizing its spread and impacts. Its populations are likely to expand throughout its introduced range. The present distributions of P. antipodarum in North America and Australia specifically are predicted to expand. In North America, it is believed to continue to spread through western watersheds and in the Great Lakes. If it reaches the rivers of the Mississippi basin, it will spread rapidly and abundantly. In Australia it is thought to continue to spread along the east coast and may establish in the southwest if a suitable vector is provided (Loo et al, 2007a). Educating anglers, hunters, boaters, aquaculturalists, and the general public about P. anitpodarum, methods of its spread, its potential impacts, and control methods is important. Because its spread to new locations is the result of human activity public awareness about P. antipodarum is necessary. The expansion of present efforts and new initiatives to slow the spread of P. antipodarum by environmental and governmental agencies such as the National Parks Service is essential to conservation (NZMS Working Group, 2006). Local and federal governments should also take steps to legally prohibit the importation, possession, and transport of P. antipodarum. In the United States California, Colorado, Kansas, Montana, Utah, Washington, and Wyoming have already done so, while Alaska, Hawaii, Idaho, Nevada, Oregon require prior authorization for its importation, possession, or transport. Colorado and California quarantined and closed fishing access to certain locations in attempts to curb its spread. Alaska, Hawaii, Indiana, Kansas, Montana, Oregon, and Washington have all developed state aquatic nuisance management plans that include P. antipodarum (NZMS Working Group, 2006). Transportation via contaminated aquatic equipment, such as wading gear, is a major method of spread of P. antipodarum (Crosier, undated; Davidson et al, 2008; Richards et al, 2004; NZMS Working Group, 2006). Several methods of removing P. antipodarum have been recommended including desiccation, heating, freezing, washing, and chemical treatment. The laying out and drying of equipment at 30ºC for at least 24 hours or at 40ºC for 2 hours has proven effective (Davidson et al, 2008; Richards et al, 2004; Crosier et al, undated). Submerging it in water at about 50 ºC for a few minutes is also effective as P. antipodarum can survive at 43 ºC for short periods (Medhurst, 2003 in NZMS Working Group, 2006). Freezing gear for 6-8 hours will also kill P. anitpodarum (Davidson et al, 2008; Richards et al, 2004; Medhurst, 2003 in NZMS Working Group, 2006). Scrubbing and thoroughly rinsing may effectively remove it as well (Crosier et al, undated). Finally, chemical treatment is also effective. Benzethonium chloride, chlorine bleach, Formula 409, Pine-Sol, ammonia, and copper sulfate all effectively kill P. antipodarum. However, bleach and Pine-Sol were found to damage some materials. The use of copper sulfate, benzethonium chloride, or Formula 409 disinfectant immersion baths or in dry sacks are believed to provide the most acceptable chemical methods of removing P. antipodarum (Hosea & Finlayson, 2005). Ballast water and hull fouling is believed to be the most common vector of introducing P. antipodarum to new locations (Alonso & Castro-Diaz, 2008). Adhering to local, federal, and international ballast water regulations such as those provided by GloBallast is essential to reducing the discharge of contaminated ballast water and helping prevent the establishment of P. antipodarum (NZMS Working Group, 2006). Although due to its very small size, it may not be practical to clean P. antipodarum off of large hulls or recreational craft in every instance, promoting information and resources to clean water craft before existing certain contaminated sites would help reduce its spread. Additionally, the cleaning of anchors may also reduce its spread (NZMS Working Group, 2006). 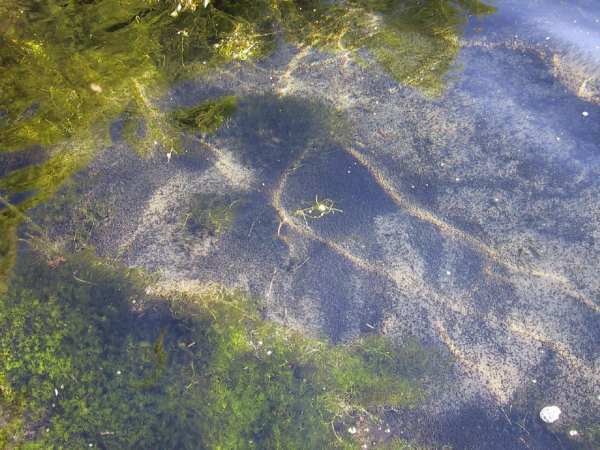 Physical: Control of P. antipodarum is possible in certain isolated locations such as small lakes, ponds, irrigation canals, and fish hatcheries. Draining waters and allowing substrate to heat and dry completely in the summer or freeze in the winter will kill P. antipodarum. Irrigation canals are routinely shut down for plant control and may be treated for snails as well (NZMS Working Group, 2006). The use of flame throwers on the walls and raceways has been effectively employed in hatcheries (Richards et al, 2004; Dwyer et al, 2003 in NZMS Working Group, 2006). It has also been suggested that barriers such as copper stripping or electrical weirs may limit the movement of P. antipodarum particularly in keeping it from high risk areas (NZMS Working group, 2006). Chemical: Chemical treatment of aquatic systems poses risks to surrounding drainages and native species. Small lakes and ponds may be isolated from drainages may isolated from drainages for chemical treatment. Chemical methods used to eradicate P. antipodarum include: Bayer 73 copper sulfate, and 4-nitro-3-trifluoromethylphenol sodium salt (TFM). The only molluscicide known to have been tested against P. antipodarum is Bayluscide (a.i. niclosamide). This test, conducted by Montana Fish, Wildlife, and Parks (FWP), was conducted in small spring creek along the lower Madison River. One hundred percent mortality was achieved after 48 exposure units, which consisted of 1 ppm Bayluscide for 1 hour (Don Skarr, Montana FWP, personal communication in NZMS Working Group, 2006). Application of GreenClean® PRO, a non-copper-based algaecide, was found to be an effective means to prevent and possibly eliminate P. antipodarum in the lab. Mortality was 100% within 72 hours of exposure to a 0.5% concentration for 2 and 4 minutes, 1% concentration for 30 seconds, and minimum of 0.33% concentration for 8 minutes. Mortality was also 100%, 48 hours after exposure to a 4% concentration for 2 minutes and 0.55% concentration for 8 minutes. Although effective in the lab, its effectiveness in the remains uncertain (NZMS Working Group, 2006). Biological control: Parasites of P. antipodarum are another potential method of control. Studies of the efficacy and specificity of a trematode parasite from its native range as a biological control have demonstrated promising results ((Dybdahl et al. 2005 in NZMS Working Group, 2006; Emblidge and Dybdahl in prep in NZMS Working Group, 2006). Also the parasite Micophallus sp. has been found to highly specific and effective in most genotypes of P. antipodarum including those in the western US (Dybdahl and Lively, 1998 in NZMS Working Group, 2006; Dybdahl & Lively, 1998 in NZMS Working Group, 2006). Integrated management: An integrated management and control plan for P. antipodarum should be implemented in locations that are colonized and those that may potentially be invaded. This plan should include preventive measures, public education, monitoring, and appropriate treatment to slow its spread and eradicate where possible and practical. Plans should account for the specific needs of individual locations and follow the guidelines provided by the Aquatic Nuisance Species Task Force (ANSTF) (NZMS Working Group, 2006). Informations on Potamopyrgus antipodarum has been recorded for the following locations. Click on the name for additional informations. Summary: This database is of alien aquatic animals inhabiting waterbodies of the Republic of Belarus. It allows to search the species by scientific taxonomy and to get information on their origin, distribution and potential ecological impacts. The database was composed in result of the analysis of literature published during the last century and authors unpublished data. One can find some general information on Belarusian waterbodies, history of construction and functioning of the interbasin shipping canals, links to related sites, etc. The site is under testing and only an English version is available, a Russian version is expected shortly. The database is available from: http://www.aliensinbelarus.com/content/view/12/28/. Dwyer, W. P.; Kerans, B. L.; Gangloff, M. M., 2003. 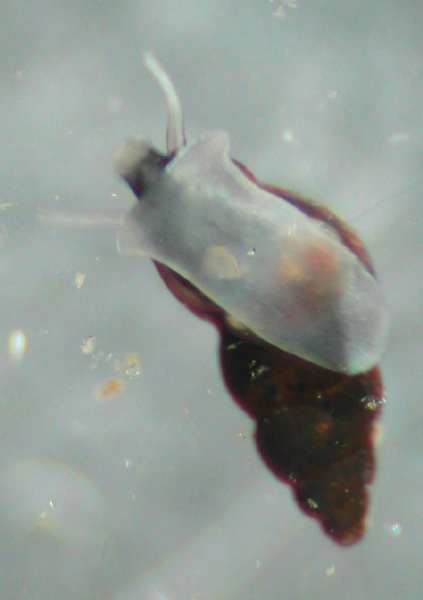 Effect of acute exposure to chlorine, copper sulfate, and heat on survival of New Zealand mud snails. Intermountain Journal of Sciences. 9(2-3). September 2003. 53-58. Hosea, Robert C. and Brian Finlayson, 2005. Controlling the spread of New Zealand mud snails on wading gear. State of California The Resources Agency Department of Fish and Game. Loo, Sarina E.; Mac Nally, Ralph; Lake, P. S., 2007. Forecasting New Zealand mudsnail invasion range: Model comparisons using native and invaded ranges. Ecological Applications. 17(1). JAN 2007. 181-189. National Park Service (NPS). 2003. New Zealand Mud Snail, Baseline Distribution and Monitoring Study. Department of the Interior. Summary: Information on the identification, impacts and management of species. Oplinger, Randall W.; Brown, Pat; Wagner, Eric J., 2009. Effect of Sodium Chloride, Tricaine Methanesulfonate, and Light on New Zealand Mud Snail Behavior, Survival of Snails Defecated from Rainbow Trout, and Effects of Epsom Salt on Snail Elimination Rate. North American Journal of Aquaculture. 71(2). APR 2009. 157-164. Schisler, George J.; Vielra, Nicole K. M.; Walker, Peter G., 2008. 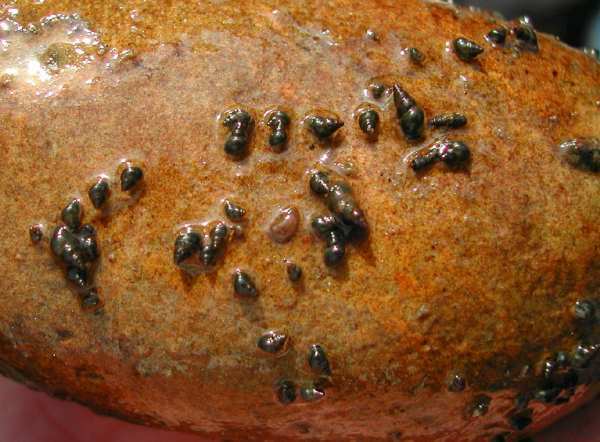 Application of household disinfectants to control New Zealand mudsnails. North American Journal of Fisheries Management. 28(4). AUG 2008. 1172-1176. Arango, Clay Porter; Riley, Leslie Anne; Tank, Jennifer Leah; Hall, Robert Ogden Jr., 2009. Herbivory by an invasive snail increases nitrogen fixation in a nitrogen-limited stream. Canadian Journal of Fisheries & Aquatic Sciences. 66(8). AUG 2009. 1309-1317. Benson, A. J. and R. M. Kipp. 2010. Potamopyrgus antipodarum. USGS Nonindigenous Aquatic Species Database, Gainesville, FL. Bersine, Karen; Brenneis, Valance E. F.; Draheim, Robyn C.; Rub, A. Michelle Wargo; Zamon, Jeannette E.; Litton, Rodney K.; Hinton, Susan A.; Sytsma, Mark D.; Cordell, Jeffery R.; Chapman, John W., 2008. Distribution of the invasive New Zealand mudsnail (Potamopyrgus antipodarum) in the Columbia River Estuary and its first recorded occurrence in the diet of juvenile Chinook salmon (Oncorhynchus tshawytscha). Biological Invasions. 10(8). DEC 2008. 1381-1388. Bruce, R. Louise; Moffitt, Christine M.; Dennis, Brian, 2009. Survival and Passage of Ingested New Zealand Mudsnails through the Intestinal Tract of Rainbow Trout. North American Journal of Aquaculture. 71(4). OCT 2009. 287-301. Carlsson, Ralf, 2000. The distribution of the gastropods Theodoxus fluviatilis (L.) and Potamopyrgus antipodarum (Gray) in lakes on the Aland Islands, southwestern Finland. Boreal Environment Research. 5(3). 25 September, 2000. 187-195. CONABIO. 2008. Sistema de informaci�n sobre especies invasoras en M�xico. Especies invasoras - Moluscos. Comisi�n Nacional para el Conocimiento y Uso de la Biodiversidad. Fecha de acceso. Dybdahl, Mark F.; Kane, Stephanie L., 2005. Adaptation vs. phenotypic plasticity in the success of a clonal invader. Ecology (Washington D C). 86(6). JUN 05. 1592-1601. Favilli, Leonardo; Manganelli, Giuseppe; Bodon, Marco, 1998. Distribution of Potamopyrgus antipodarum (Gray, 1843) in Italy and in Corsica (Prosobranchia: Hydrobiidae) Atti della Societa Italiana di Scienze Naturali e del Museo Civico di Storia Naturale di Milano. 139(1). July, 1998. 23-44. Gerard, Claudia; Blanc, Alexia; Costil, Katherine, 2003. Potamopyrgus antipodarum (Mollusca:Hydrobiidae) in continental aquatic gastropod communities: Impact of salinity and trematode parasitism. Hydrobiologia. 493 15 February, 2003. 167-172. Gerard, Claudia; Le Lannic, Joseph, 2003. Establishment of a new host-parasite association between the introduced invasive species Potamopyrgus antipodarum (Smith) (Gastropoda) and Sanguinicola sp. Plehn (Trematoda) in Europe. Journal of Zoology (London). 261(2). October 2003. 213-216. Grigorovich, Igor A.; Korniushin, Alexei V.; Gray, Derek K.; Duggan, Ian C.; Colautti, Robert I.; MacIsaac, Hugh J., 2003. Lake Superior: An invasion coldspot? Hydrobiologia. 499 1 June, 2003. 191-210. Gruszka, P., 1999. The river Odra estuary as a gateway for alien species immigration to the Baltic Sea basin. Acta Hydrochimica et Hydrobiologica. 27(5). Nov., 1999. 374-382. Herbst, David B.; Bogan, Michael T.; Lusardi, Robert A., 2008. 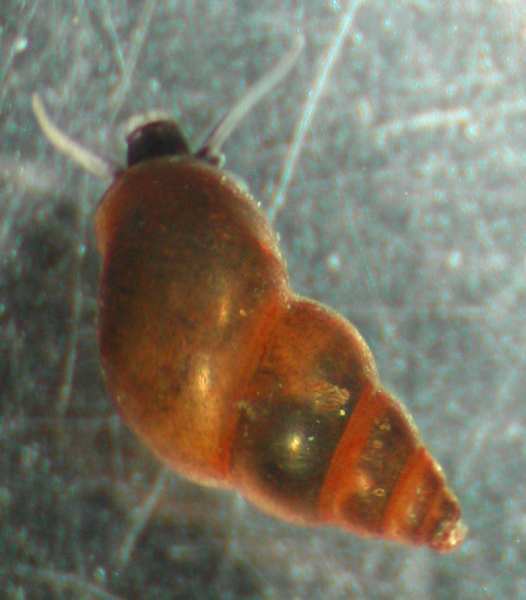 Low specific conductivity limits growth and survival of the New Zealand mud snail from the Upper Owens River, California. Western North American Naturalist. 68(3). SEP 2008. 324-333. Holomuzki, Joseph R.; Biggs, Barry J. F., 2007. Physical microhabitat effects on 3-dimensional spatial variability of the hydrobiid snail, Potamopyrgus antipodarum. New Zealand Journal of Marine & Freshwater Research. 41(4). DEC 2007. 357-367. Kerans, B. L.; Dybdahl, M. F.; Gangloff, M. M.; Jannot, J. E., 2005. Potamopyrgus antipodarum: distribution, density, and effects on native macroinvertebrate assemblages in the Greater Yellowstone Ecosystem. Journal of the North American Benthological Society. 24(1). March 2005. 123-138. Kofler, Alois; Mildner, Paul, 2004. Third supplement on the mollusk fauna of East Tyrol (Mollusca: Gastropoda, Bivalvia). Berichte des Naturwissenschaftlich-Medizinischen Vereins in Innsbruck. 91 2004. 129-155. Kolodziejczyk, Andrzej; Lewandowski, Krzysztof; Stanczykowska, Anna, 2009. Long-term changes of Mollusc assemblages in bottom sediments of small semi-isolated lakes of different trophic state. Polish Journal of Ecology. 57(2). 2009. 331-339. Krodkiewska, Mariola; Strzelec, Malgorzata; Serafinski, Wlodzimierz, 1998. Potamopyrgus antipodarum (Gray) (Gastropoda, Prosobranchia) a dangerous newcomer in malacofauna of Poland. Przeglad Zoologiczny. 42(1-2). 1998. 53-60. Levri, Edward P.; Jacoby, Warren, 2008. 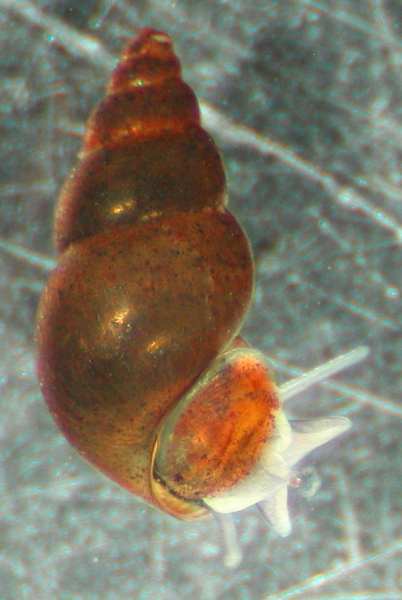 The invasive New Zealand mud snail (Potamopyrgus antipodarum) found in streams of the Lake Ontario Watershed. Journal of the Pennsylvania Academy of Science. 82(1). AUG 2008. 7-11. Levri, Edward P.; Kelly, Ashley A.; Love, Eric, 2007. 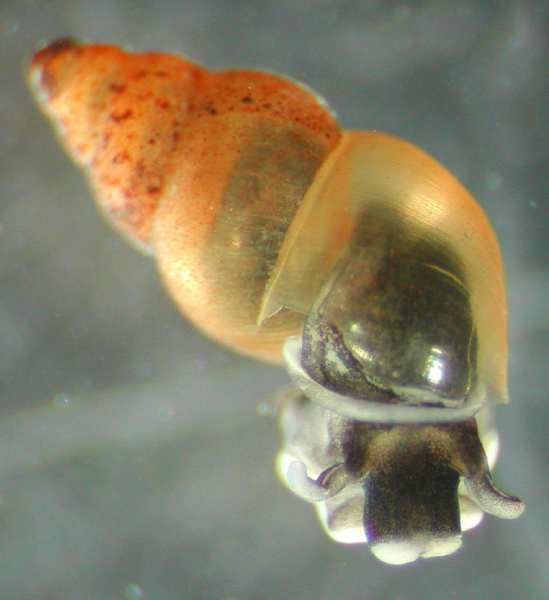 The invasive New Zealand mud snail (Potamopyrgus antipodarum) in Lake Erie. Journal of Great Lakes Research. 33(1). MAR 2007. 1-6. Lewin, Iga; Smolinski, Adam, 2006. Rare and vulnerable species in the mollusc communities in the mining subsidence reservoirs of an industrial area (The Katowicka Upland, Upper Silesia, Southern Poland) Limnologica. 36(3). SEP 2006. 181-191. Lively, C. Undated. Potamopyrgus antipodarum. Indiana University: Department of Biology. Bloomington, IN. Summary: Information on reproduction and genetics of species. Lysne, Steven; Koetsier, Peter, 2006. Experimental studies on habitat preference and tolerances of three species of snails from the Snake River of southern Idaho, USA. American Malacological Bulletin. 21(1-2). FEB 9 2006. 77-85. Richards, David C.; Cazier Shinn, Dianne, 2004. Intraspecific competition and development of size structure in the invasive snail Potamopyrgus antipodarum (Gray, 1853) American Malacological Bulletin. 19(1-2). OCT 14 2004. 33-37. Richards, D., B. Kerans, and D. Gustafson. 2002. New Zealand Mudsnail in the Western USA. Montana State University: Department of Ecology. Summary: Information on identification, and life history, and habitat of species. Available at: http://www.esg.montana.edu/aim/mollusca/nzms/ [Accessed 11 October 2003]. Riley, Leslie A.; Dybdahl, Mark F.; Hall, Robert O. Jr., 2008. Invasive species impact: asymmetric interactions between invasive and endemic freshwater snails. Journal of the North American Benthological Society. 27(3). SEP 2008. 509-520. Schreiber, E. S. G.; Glaister, A.; Quinn, G. P.; Lake, P. S., 1998. Life history and population dynamics of the exotic snail Potamopyrgus antipodarum (Prosobranchia: Hydrobiidae) in Lake Purrumbete, Victoria, Australia. Marine & Freshwater Research. 49(1). 1998. 73-78. Schreiber, E. S. G.; Lake, P. S.; Quinn, G. P., 2002. Facilitation of native stream fauna by an invading species? Experimental investigations of the interaction of the snail, Potamopyrgus antipodarum (Hydrobiidae) with native benthic fauna. Biological Invasions. 4(3). 2002. 317-325. Schreiber, E. S. G.; Quinn, G. P.; Lake, P. S., 2003. Distribution of an alien aquatic snail in relation to flow variability, human activities and water quality. Freshwater Biology. 48(6). June 2003. 951-961. Shimada, Kumiko; Urabe, Misako, 2003. Comparative ecology of the alien freshwater snail Potamopyrgus antipodarum and the indigenous snail Semisulcospira spp. Venus (Tokyo). 62(1-2). June 2003. 39-53. Soler, J.; Moreno, D.; Araujo, R.; Ramos, M. A., 2006. Diversity and distribution of freshwater molluscs of Comunidad de Madrid (Spain) Graellsia. 62(Sp. Iss. SI). 2006. 201-252. Staedler, T.; Frye, M.; Neiman, M.; Lively, C . M., 2005. Mitochondrial haplotypes and the New Zealand origin of clonal European Potamopyrgus, an invasive aquatic snail. Molecular Ecology. 14(8). JUL 05. 2465-2473. Strayer, David L., 1999. Effects of alien species on freshwater mollusks in North America. Journal of the North American Benthological Society. 18(1). March, 1999. 74-98. Strzelec, Malgorzata, 2000. Effect of artificially elevated water temperature on growth and fecundity of Potamopyrgus antipodarum (Gray) in anthropogenic water bodies in Southern Poland (Gastropoda: Prosobranchia: Hydrobiidae) Malakologische Abhandlungen (Dresden). 19(2). 15 Dezember, 2000. 265-272. Strzelec, Malgorzata, 2005. Impact of the introduced Potamopyrgus antipodarum (Gastropoda) on the snail fauna in post-industrial ponds in Poland. Biologia (Bratislava). 60(2). MAR 05. 159-163. Summary: Information on distribution, general impacts. Vinson, Mark R.; Baker, Michelle A., 2008. Poor growth of rainbow trout fed New Zealand mud snails Potamopyrgus antipodarum. North American Journal of Fisheries Management. 28(3). JUN 2008. 701-709. Weetman, David; Hauser, Lorenz; Carvalho, Gary R., 2006. Heterogeneous evolution of microsatellites revealed by reconstruction of recent mutation history in an invasive apomictic snail, Potamopyrgus antipodarum. Genetica (Dordrecht). 127(1-3). MAY 2006. 285-293. Zbikowski, Janusz; Zbikowska, Elzbieta, 2009. Invaders of an invader - Trematodes in Potamopyrgus antipodarum in Poland. Journal of Invertebrate Pathology. 101(1). APR 2009. 67-70. Zettler, Michael L.; Richard, Doreen, 2004. Freshwater molluscs from Corsica. Notated collections from summer 2003 with emphasis on Theodoxus fluviatilis. Malakologische Abhandlungen (Dresden). 22 2004. 3-16. Biology, ecology, and systematics of freshwater invertebrates. Arthur Rylah Institute for Environmental Research Department of Sustainability and Environment.